Our definition of child abuse is pretty broad. We lock up parents for leaving their children in overheated or unheated cars, for refusing to vaccinate, for leaving drugs around the house, and a host of other dangerous behaviors that put kids’ lives at risk. Not so with asylum seekers. The recent deaths of two children at the border were pinned on people trying to do their jobs instead of the people who took them on a too-dangerous journey. The Border Patrol is in political limbo. These federal employees do their best for a nation and government where too many believe they are the enemies. Whether or not these are the only lives lost, rest assured that these children died in CBP custody because they were lured here by Democratic Party policy. We don’t blame a family whose house was robbed because they were better off than the thieves. People who are assaulted aren’t held accountable because their nice clothes make them a target, but this is the kind of rationale Democrats use to blame federal workers because children died during a border crisis that can only rightfully be blamed on party policy. There are two dead children on the record that neither the CBP, the White House, nor Republicans should have to answer for. They may have died regardless of where they were or whose custody they were in. Children of well-to-do families died during the 2017-2018 flu season. It happens. We can’t always prevent it, but blaming CBP is a political imperative that insinuates we can and didn’t do the right thing to protect their lives. America locks up citizens all the time for subjecting their kids to a lot less suffering than what migrant children endure on their trek to the U.S., yet the individuals who brought them on a perilous journey to America are held blameless. So are Democrats who lured them to our country with talk of immigrant rights and asylum. Another accusatory missive from Democrats to the House and Senate Judiciary and Homeland Security Committees went out on December 19, 2018. After the death of a second Guatemalan child Nielsen, McAleenan, and Kelly got a second letter demanding answers by January 15, 2019. Again, no responsibility was accepted for the Democratic Party policies that brought these children to the U.S.
That’s what happens when you promise asylum and a better life courtesy of the Democratic Party. No matter how true or disturbing none of Nielsen’s testimony matters. What’s important is the blame game that is going to get much worse now that the party of open borders rules the House. When lawmakers block, obstruct, and demonize any and all attempts to secure the southern border they create the crisis they blame on the CBP’s Border Patrol, Homeland Security, and the president. Families and unaccompanied children will continue to show up because they hear that the U.S. will let them in. Democratic policy tells them this is all well and good and their right, but our laws say otherwise. Violating those laws mean bad things can happen, like children dying because refusing to solve this problem has extreme political value for Democrats. 1. “NM, TX Lawmakers Demand Answers on Death of 7-Year-Old Migrant Child in CBP Custody.” Michelle Lujan Grisham. December 17, 2018. https://lujangrisham.house.gov/media-center/press-releases/nm-tx-lawmakers-demand-answers-death-7-year-old-migrant-child-cbp, retrieved December 17, 2018. 2. “Top House Democrats Call for Preservation of Records Related to Child Deaths in CBP Custody and Announce Plans for Oversight Hearings in 116th Congress.” Homeland Security. December 27, 2018. https://homeland.house.gov/news/press-releases/top-house-democrats-call-preservation-records-related-child-deaths-cbp-custody, retrieved January 4, 2018. 4. “Written testimony of DHS Secretary Kirstjen Nielsen for a House Committee on the Judiciary hearing titled “Oversight of the Department of Homeland Security.” Homeland Security. December 20, 2018. https://www.dhs.gov/news/2018/12/20/written-testimony-dhs-secretary-nielsen-house-committee-judiciary-hearing-titled, retrieved January 1, 2019. Image: Denmark, Josh. 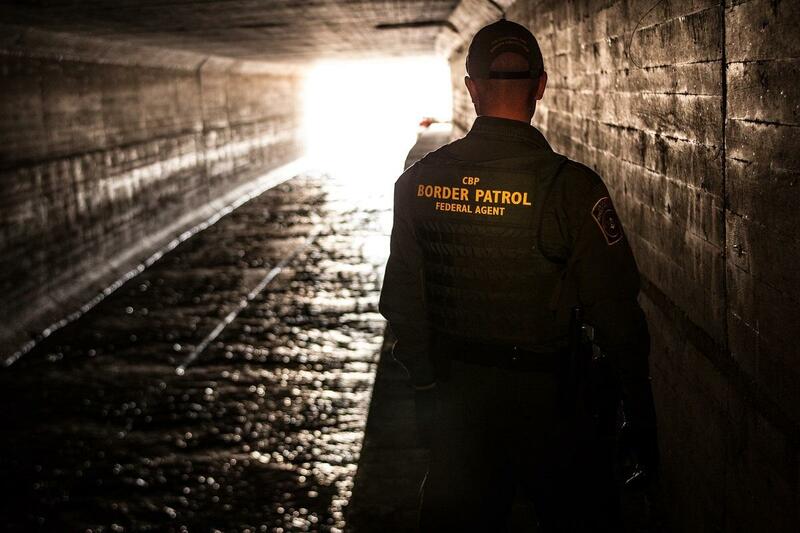 “Border Patrol agents inspect a water drainage tunnel that spans from Nogales, Ariz. into Mexico.” U.S. Customs and Border Protection. Retrieved from https://www.cbp.gov/sites/default/files/photo/Water%20Drainage%20Tunnel%20from%20Mexico-Nogales%2C%20AZ-JD%201200_0.jpgon January 6, 2019.